WOW what a month in Ottawa Real Estate! 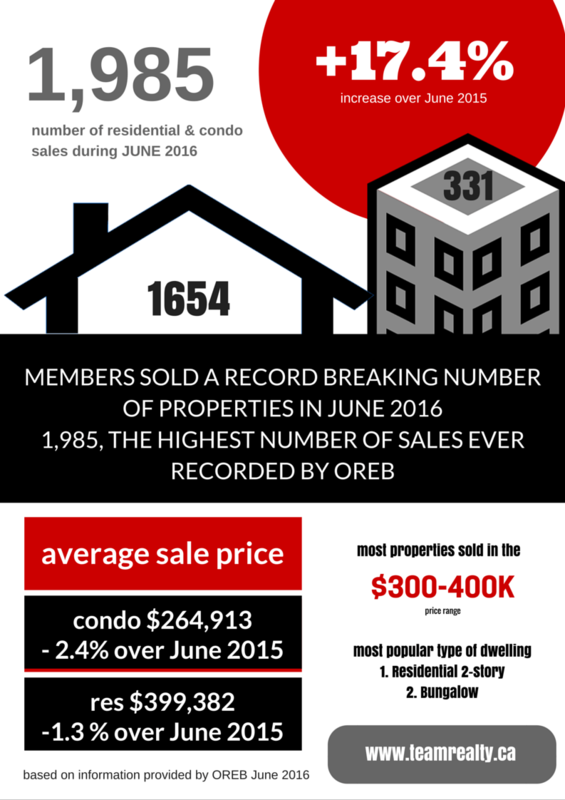 Members of the Ottawa Real Estate Board sold 1,985 residential properties in June 2016 through the Multiple Listing Service® setting a record for the highest sales in any month ever in the history of the Ottawa Real Estate Board. While average price dropped slightly in both residential (slight decrease of 1.3% over June 2015) and condominiums (slight decrease of 2.4% over June 2015) the market in Ottawa remains sure and steady. While these statistics are useful in establishing market trends they should not be used as an indicator that specific properties have increased or decreased in value. If you’re interested in a free home evaluation or statistics for specific neighbourhoods email info@teamrealty.ca – we would be delighted to assist. Members of the Ottawa Real Estate Board sold 1,985 residential properties in June through the Board’s Multiple Listing Service® System, compared with 1,691 in June 2015, an increase of 17.4 per cent. The five-year average for June sales is 1,717. “It’s hard to say what fuelled this surge for June. It could be a combination of great weather and buyer activity from other markets, or it could be an anomaly. We will be closely watching the trend over the summer when sales typically slow down as buyers turn their attention to summer activities,” Silva went on to explain. June sales included 331 in the condominium property class, and 1,654 in the residential property class. The condominium property class includes any property, regardless of style (i.e. detached, semi-detached, apartment, townhouse, etc. ), which is registered as a condominium, as well as properties which are co-operatives, life leases, and timeshares. The residential property class includes all other residential properties. The average sale price of a residential-class property sold in June in the Ottawa area was $399,382, a decrease of 1.3 per cent over June 2015. The average sale price for a condominium-class property was $264,913, a decrease of 2.4 per cent over June 2015. The Board cautions that average sale price information can be useful in establishing trends over time but should not be used as an indicator that specific properties have increased or decreased in value. The average sale price is calculated based on the total dollar volume of all properties sold.